My granddad served on the KGV and was on shore in Malta during 1951 when (as far as we know) a submarine officer crashed into his horse and carriage killing him instantly. His name is Thomas Frederick Wilson and was 28 years old. He was from Kidderminster, Worcestershire and was married to Joyce with 2 young sons at the time of his death. He was featured in the Kidderminster Shuttle with some other sailors but I'm unable to trace anything more about him. He was known as Goldie or Blondie.... Please help! My records indicate Able Seaman Thomas Frederick Wilson (JX/ 801106) was killed Aug. 17, 1951, and that he was assigned to HMS Saintes D-84. My Granddad is John Hamilton. He was the Chief Petty Officer on the KG5 during the Second World War (that's the rank I have been told he held). It would be great to hear from anyone who can supply any information about my Granddad. I was told, like others on the board, that he wouldn't talk about the war. I was only 11 or 12 when he died so I didn't get a chance to speak to him about it myself. 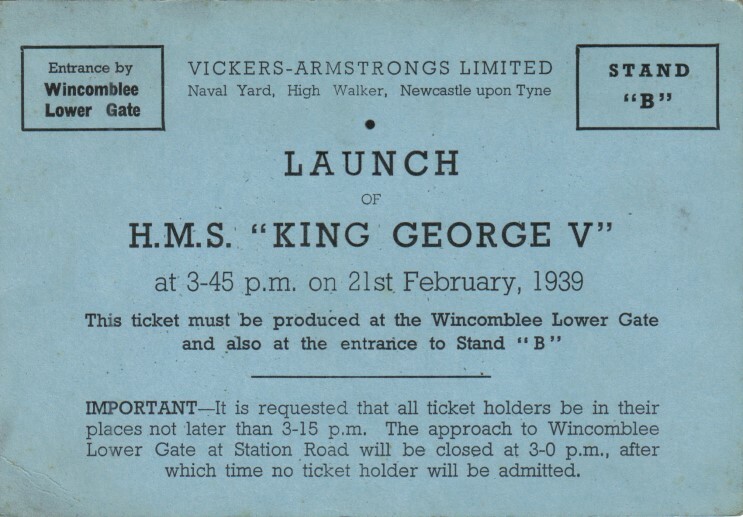 As a 7 year old I was present at the launch of H M S King George V in the charge of my mother's daily help. My youngest brother was about due and I was, I suspect, being kept out of the way. I think that my grandfather, Sir Edward George, managing Director of the Consett Iron Company would have been one of the platform party. We were positioned between K G V and Victorious under construction. I remember the sight and sounds very well. In 1956, a 25 year old engineer, I was called up for National Service in the Royal Naval Reserve and after training appointed to HMS Llandaff, F61, as Ordnance Engineer. She was just about to commission at Hawthorn Leslies's Yard at Hebburn. Very convenient as my home was at Consett! My Uncle, Verner A. Morgan, served on the HMS King George V during the sinking of the Bismarck. Verner and his family are from Newfoundland, Canada (although Newfoundland was a British Colony at the time of the war and up to 1949). He was a gunner during the war. Another neighbour, Cecil Anthony, also served on the KGV during the Bismarck sinking. I wonder if any of their friends are still around. Uncle Verner passed away in 2006, while Mr. Anthony passed in 2004. Hope I can find someone who knew one or both of them. I'm sure his family would love to correspond. My grandfather, David Burns, served aboard HMS King George V when the Bismarck was sunk. I believe he was a cook on the ship. Does anyone out their recognise his name as a friend of a relative perhaps or know of any stories about him? I am very interested to get copies of the Christmas menus that Julie Nelson of Manchester mentioned on April 23rd 2009. If anyone has any information about him at all, I'd be most grateful. My grandfather, Roy Allen Turner, served on KG5 during WWII. Do you have any information about his service. My grandfather, Malachi (Malcolm) Yates, served on King George V during the battle and sinking of the Bismarck. I am looking for some information on his position and regiment he served in. Can you help? My grandfather, Clement Bilsborough, served on HMS King George V during WW2, I believe he was a Stoker. Can you tell me how I can find out more about his naval career and his records, he died in 1982 and I only have limited knowledge as I was a child when died, but remember stories about him working around Bombay. We are looking to find out more about his time on board and are unsure of how many years he actually served. Would there be a crew list or crew history records I could get hold of and if so could you give me info as to where I can find them. I have just found your site and enjoyed reading all the comments. My father, George Arthur Rudd, was on HMS KGV June 1942 - April 1944. I have just received his Service History. Would be great if I could find people who may have served around the same time as him. My Dad was Fred (Nobby) Clarke, who sadly passed away in 1981. He was from Liverpool, so was probably also known as `Scouse` during his Navy days. He was a stoker on the KGV during the sinking of the Bismarck. He would tell the story as an 18 year old he put on his life jacket when he heard and felt the sound of their own guns only to be told the hatches would be secured so there was no way out for those down below. Another old sailor who I also met, and knew my dad was Jimmy Deveney (may have been spelt Devine) who I believe was a Royal Marine on the KGV and also from Liverpool. Jimmy was a Police Officer in Liverpool who I also spoke to on a number of occasions. In the early 1970's, Jimmy lived near to the Bow and Arrow Pub which was in Princess Drive, Liverpool. I would love to hear from anyone who knew my dad or Jimmy or view any photos of ships crew, particularly the stokers or members of the crew in the engine room. My great Grand father John Joseph Fenwick according to what I have been told by father worked on the munitions for King George V at Elswick. He was according to my dad presented to the King at the launch as he was shortly due to retire and had not lost a day sick since joining the company aged fifteen (or was it sixteen). My dad says he remembered seeing a photo of his grandfather with the King but their is no trace of it now and I have been unable to prove the facts one way or another including checking the local newspapers for mention. My friend is trying to find any photos that may have been taken of her father Lesley George Anthony Lynn who was on board the King George V as Chief Petty Officer in the engine room during the sinking of the Bismarck. I have spent time looking at the many websites that are available regarding this ship but unfortunately have not been able to find any photos or information listing him as part of the crew. I would really appreciate it if you could pass on any information you may have on Les. Unfortunately her dad has passed away but would love to find out more about his connection with "King George V" battleship. My Father served on the King George V during WW2. I believe he was an engineer on the ship. His name was John Lynch. Unfortunately, he died in 1962. After the war John worked as an engineer and married my mother Jean. They had two children; Anne and Allister then in 1959 I was lucky enough to be adopted into the family, but never got to know John as he passed away before I was 3yrs old. He never mentioned the war to my mother and it wasn't until 1990's that she found out about the sinking of the Bismarck and the role the King George V during a visit to York. We are all proud of John and on a visit to Malta a few years ago, I was touched by the Maltese people who remember what it meant to see the Royal Navy sail into port all those years ago. 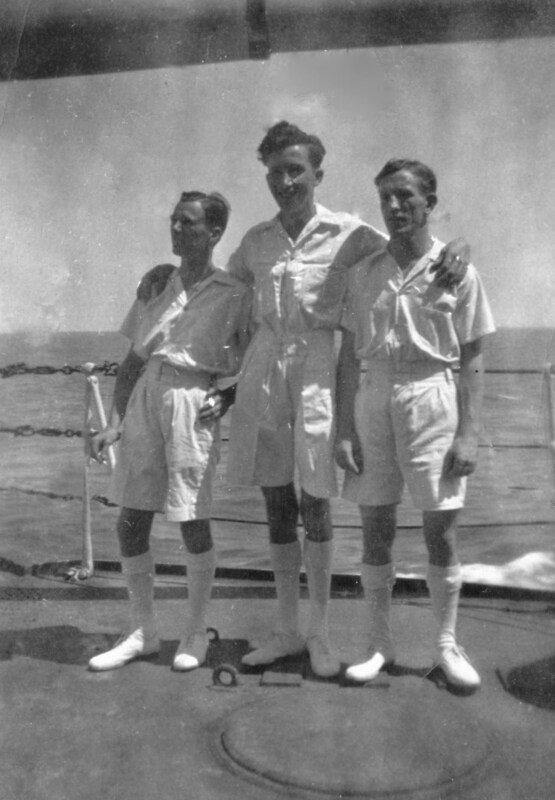 John Lynch (middle) and two unidentified crewmen seen onboard HMS King George V during the Second World War. The smaller of the two men, shown in the photograph standing either side of John Lynch, David`s father appears very very similar to my father Freddy (Nobby) Clarke who was a stoker on the KGV (See my message No 15). My father Maurice Cluer was on the King George V at the time of the sinking of the Bismark. He also told me he was on the wheel in the wheelhouse at the sinking of the Punjabi. He was a Leading seaman at the time and left the ship in 1944 to do a Physical Training Instructors course at Victory barracks. He left the Navy in 1947 to become a police officer. He is now 87 and very much alive. I want to say that I was Maurice Cluer's friend and pen pal, though four years younger, from his training period, and through the war, but we lost touch after I left home. I'd love to have email contact with Peter, so messages to Maurice could be conveyed. My home is now near Reading, but my thoughts are often on the places Maurice and I knew when young. My father was a gunner on the KGV during the sinking of the Bismarck. His name was Robert “Jock” Devlin. My mom says he never really talked about the war. Wonder how many of those brave souls are left. If anyone has any info, please reply. My father Harry Clear served on the KGV from 1942 to 1946, quarterdeck lockerman. I have just introduced him to the wonders of the net. He would be interested in finding crew lists etc from his time in service. He was also on HMS Ocean from 1951 to 1953, flight deck party. He spent a short time on the Implacable, The Duke of York and the Peregrine. My granddad served on the King George V in the 2nd World War, he was on it during the sinking of the Bismarck, I have lots of photos, Christmas menus, anniversary of commissioning paperwork and his silver teaspoon!! I would love to find out if anyone remembers him, his name was Frank Cormell and I think he was also the ship's barber!! Below). Thank you for the detail on your site along with the excellent photographs which allow me to see the vessel in its prime. Attached is a photo of HMS King George V (see 4th photo, page 1) taken in Iceland in May 1942, following a collision and sinking of the HMS Punjabi off Iceland. Would any of your readers have any knowledge of when the photograph (taken at Hvalfjörður (Hvalfjord) or Seydisford, Iceland) was first published/released? Perhaps after 1945? My mother designed the hangings for the chapel of the King George V. At the time she worked at Mowbray's. Would you have any pictures or information on the chapel that I could share with her? I am doing family tree research and I am now interested in anyone whom served on HMS King George V with my Grandfather. His name is Leonard Albert Ludlow (dob-19/03/1925). He was a gunner and as far as my father can remember his father was an Able Seaman but unsure, if someone out there was on board this ship with my grandfather it would be greatly appreciated if that someone could get in contact with me. My father has the only thing left of my Grandfathers and that is an original photo of HMS King George V with the Sydney Harbour Bridge in the background. If anyone has any photos of my Grandfather while serving in the British Navy I would be grateful if they could contact me or send me something as proof. As a 7 year old I was present at the launch of KGV in the care of my mother's cleaning lady. My grandfather was with the official party in his capacity as General manager of the Consett Iron Company. The sight and sound of the occasion are still very much in my memory. The only photograph I have seen of the launch was in a recently published book on the Bismarck action written originally in Polish. The picture is from the wrong side so does not show that part of the crowd in which I was standing. The photograph surprisingly is in a Warsaw archive. I would be most interested if there are other photographs of the launch. My father, Donald Menzies (RCNVR), was present on the King George V during the signing of the Japanese surrender. He was a language interpreter. I wonder if someone out there remembers him and/or his role during the surrender. I am trying to trace service records of my father, Sydney Baldam, who served on the King George V during the Second World War. Could you please tell me if you have any information as to where I would start.